PRODUCT: 1-1/4" length x .120" wire, Hot Diipped Galvanized, STANDARD shank, Coil Roofing Nails, Wire Collated, 120/coil, 60 coils/box. 7200/Box. Price/Box. 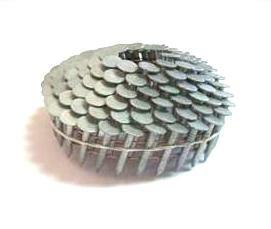 1-1/4 x .120 EG Coil Roofing Nails, RING Shank, 3/8 Head. 120 Nails/Coil, 60 Coils/Box. 7200 Nails/Box. Price/Box.